reintroduction of buffer blocks in Kate’s document buffer (one buffer contains up to 4096 lines). The blocks build a linked list. Editing a 500 MB file kind of works now again. It’s still rather slow, though. find in files: redesign of workflow. Search happens with non-modal dialog and results are shown in toolviews. I’ve added a new plugin to kdesdk/kate/plugin: a backtrace browser. It’s meant for developers and probably of no use for users. What does it do? 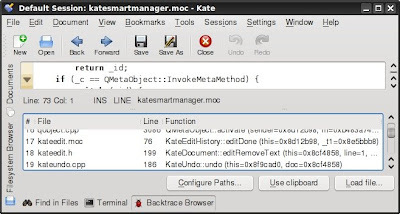 It shows a backtrace delivered by gdb in a listview in a Kate toolview. Clicking on an item opens the selected file and jumps to the correct line number. It works for backtraces generated on your own machine, but it will also work for backtraces from other people, i.e. with /home/dummy/qt-copy/…/qwidget.cpp will still be found on other machines. For that to work, you have to index the directories where the source code is located. Sometimes there are several files with the same name, e.g. and then usually finds the correct one. Indexing trunk/KDE and branches/KDE/4.1 of course will lead to a clash, now way to fix it. Maybe I could present a list of valid files to the user and let the user pick the right one. I don’t think that’s necessary though for now. When indexing is finished, open the toolview “Backtrace Browser”. Now you can load a backtrace from the clipboard (e.g. when you clicked “Copy to Clipboard” in Dr. Konqi) or from a file.